Nirav Modi’s collection, including a Ravi Varma painting worth Rs 4 crore, is set to be auctioned to recover income tax dues of Rs 95 crore. New Delhi: Fraud accused businessman Nirav Modi’s painting collection is worth Rs 57.72 crore, and will soon be auctioned by the Income Tax Department to try and recover dues of Rs 95 crore. The jewel of Modi’s collection is a painting by Raja Ravi Varma, titled ‘The maharajah of Travancore and his younger brother welcoming Richard Grenville in 1880’. The painting is worth Rs 4 crore. In all, Modi’s collection has 68 works of art, including those by celebrated artists like V.S. Gaitonde, M.F. Husain, Amrita Sher-Gil, K.K. Hebbar, Anjolie Ela Menon, Vishwanath Nageshkar, Nandalal Bose and Vivan Sundaram. 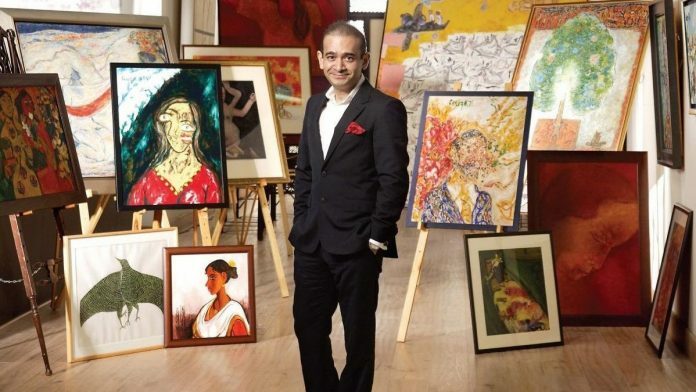 “A total of 173 paintings belonging to M/s Camelot Enterprise Private Limited that are beneficially owned by Nirav Modi were seized by Income Tax Authorities during the course of investigation for recovery of income tax dues of Rs 95.91 crore. As these paintings were beneficially owned by Modi through a dummy entity, these paintings valued at Rs 57.72 crore were also provisionally attached by Enforcement Directorate (ED),” a court document said. Apart from the paintings, the PMLA special court Wednesday also allowed the ED to sell 11 vehicles belonging to Modi. These cars include a Rolls Royce, a Porsche, a Mercedes and a Toyota Fortuner SUV. According to a CBI source, the team in India will now assist the UK’s Crown Prosecution Service to expedite Modi’s extradition process. Modi is accused of defrauding Punjab National bank to the tune of Rs 11,800 crore by getting over 293 Letters of Understanding (LoU) issued. These LoUs were issued to Modi and his companies in 2017 and 2018. A LoU is a guarantee given by a bank in India to an overseas bank that it will meet the liability if the firm borrowing from it (the foreign bank) defaults. Diamond firms use LoUs for securing cheap, low interest ‘buyer’s credit’ in dollars overseas, mostly to purchase rough diamonds. Banks are always supposed to cover their LoUs against collaterals, which wasn’t allegedly done in this case. Meanwhile, the PMLA court has also issued an open-ended non-bailable warrant against Modi’s wife Ami on the request of the ED, paving the way for further action. Ami was named in a supplementary chargesheet, underlining her role in the US $2 billion PNB scam.